Travel habits are changing. With the rising popularity of services like AirBnb, travelers are enjoying increased lodging options that give them the creature comforts of home. Booking a luxury villa is one option that gives couples, families, and/or friends the option to split costs on a holiday while spending more quality time together. Should You Book a Luxury Villa for Vacation? Are you torn between a hotel and a luxury villa? Start by determining your priorities. Do you want total peace and quiet and don't mind going inside to make your own drink? Want to be close to your traveling companions and not have to go from hotel room to hotel room? Prefer to cook at home and no have to go out every night? If so, a luxury holiday villa may be right for you. How long is your holiday? In most cases, villas are priced by the week and cannot be rented for a shorter period of time. So, if your group is planning to divide a week up in different destinations, a luxury villa may not work for you. Is your destination conducive to staying in a villa? If you're in a destination that has expensive public transportation and the villa is an hour outside of town, you'll need to rent a car and spend time driving. When looking at island locations, don't be tricked by being only a few miles from town. When you're talking about a distance of three miles on a small island, the villa can be pretty remote and may take you an hour to get into town. What's With Luxury Villa Holiday Rentals? The amenities of a luxury villa holiday can vary widely. It's crucial you read the fine print and description of each villa. Villas are typically owed by individuals and may be rented as such, or may be included in a rental pool at a complex, with the ability to take advantage of the resort hotel amenities. Some villa owners may include groceries and/or a chef in the total price, while others may offer nothing but a remote caretaker in case of emergencies. Wi-Fi is usually included, but the listing should specify if it is or not. Household utilities, final cleaning, bed linens and towels are typically standard amenities included in the villa rate. It's not uncommon for villa rentals to include watersports equipment like kayaks, canoes, and/or maybe a paddleboard. Some really high-end villas might offer boat transportation with a captain, or a golf cart in some Caribbean destinations. If the villa doesn't come with airport transfers, pre-booked tours, car rental, groceries, etc., ask what add-on services might be available. Villa owners often contract with various other tour providers and may get discounted rates as. Including airfare is more rare, but not completely unheard of. If you're booking a luxury villa vacation through a big travel website, you might be able to bundle the same as you would when searching for a flight and hotel room. Destinations in Southeast Asia, especially spots like Bali, are ideally suited for luxury villa rentals. Get lost in a tropical retreat like Villa Ria Sayan in Ubud, Bali (pictured). Villa Ria Sayan has two bedrooms and sleeps four people. Enjoy traditional Balinese living surrounded by beautiful fruit trees and gardens. There is a private infinity pool that overlooks the Sayan Gorge. Airport transfer service, chef, continental breakfast, full-staff, night security, and more included. Nightly rates start as low as $375 per night during low season (minimum 2 night stay) to $485 a night during peak season (minimum 7 night stay). Belize might not be the first destination that pops into your mind when you think luxury villa holidays, but the country has a number of private villas that are stunning. One of the best spots in the country is Ambergris Caye, where you can find a number of beachfront villas like Wataview. This luxury villa is just south of San Pedro, Ambergris Caye's town. It is a beachfront property with five bedrooms and a swimming pool, hot tub, tennis court, basketball net, gym, outdoor bar, and more. Airport transfers, housekeeping, laundry services, and chef services for up to two meals per day for 10 people (food cost extra) are included. Rates are $2,249 per night for the regular season, while Christmas season rates start at $2,400 a night. The Catalunya region of Spain is filled with beautiful castles, sprawling countryside villas, and coastal mansions. 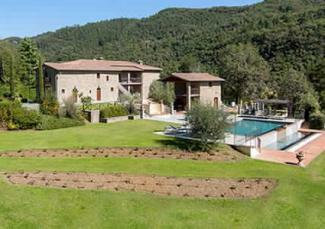 Choose a luxury villa like Sa Vista, located near the town of Cadaques in Costa Brava. Sa Vista sleeps up to 16 people and overlooks the Bay of Cadaques, surrounded by olive trees. Cadaques is a famous bay in Catalonia, also home to the Dali Museum. The massive home has a stunning outdoor area with pool, a game room, cinema room, and more. Add-on services include tours, car rental, and airport transportation. Rates start at 7,700 Euros per week for the off-season and go up to 19,250 Euros during the summer months. Europe's wine country regions are perfect for travelers looking to immerse themselves in the rustic countryside. 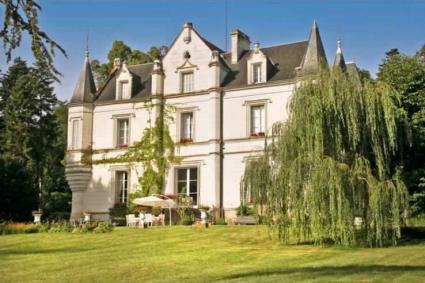 Look to rent a Chateau along France's famed Loire Valley, like Chateau St. Jean. Chateau St. Jean is a seven bedroom French-style chateau with views of woodland, private parkland, and the local village. There's a large swimming pool with pool house and bicycles included. Average rates are GBP 2500 to GBP 4500 a week. Alternately, head to Tuscany, Italy, and book a six-bedroom villa like Podere Casentino (pictured). This Tuscan retreat sleeps up to ten people and has the signature Tuscan terracotta floors, beamed ceilings, ample outdoor dining space, and a rustic feel indoors. The villa has a host of modern amenities, including a swimming pool, outdoor gym, Wi-Fi, satellite TV, sauna, and more. Rates start at 4,896 GBP per week. Skip the hotels and look at the private villas available in places like Santorini, Greece. The island is filled with high-end luxury villas that are for rent during the summer season, and the views are unsurpassed. Another island to consider is Crete, with options like Villa Kamy. Villa Kamy sleeps up to ten people and is carved into the rocky landscape at the Bay of Chania. Rates for the summer can be GBP 5,295 while winter rates start at GBP 3,362. Planning that family summer vacation to Walt Disney World or other Orlando-area theme parks? If you're at the theme parks all day, renting a holiday villa can give you time to decompress before battling the summer crowds and Orlando's humidity! Options include villas at Reunion Resort that can sleep up to 24 people and feature nearly 15,000 square feet of luxury living. The villa features a bowling alley with two lanes, private squash court with a retractable basketball hoop, private home cinema, games room, spa room, arcade, private gym, and a custom private swimming pool. It has views of the golf course and is only 5.5 miles away from Walt Disney World. Rates start at $15,000 per week. Ski vacations mean lots of time on the slopes followed by warming up by the fireplace. How nice would it be to have your own personal winter wonderland? In destinations like Lake Tahoe, you can rent stunning lakefront luxury villas that are just a quick trip to the ski slopes. Tewesi Manor sits on 200 feet of lakeshore with its own pier and ramp. Enjoy lake views from almost every room in the house along with a giant fireplace, hot tub, and luxurious touches throughout. Rates start at $3,650 per night or $22,000 per week. Charming Villas Catalonia - This company specializes in the Catalonia region, including popular destinations like Costa Brava. Luxury Retreats - The organization offers luxury villa rentals all over the world. Abercrombie & Kent - This luxury vacation company operates a separate website for luxury villa rentals in several key European locations. Narrowing down luxury villa destinations and amenities is work enough, but the final step is actually booking your dream vacation. Some villas may not only require a credit card deposit to hold your reservation, but also a hefty cash deposit as well. This ensures there is a cushion for any damage that arises during your stay. Luxury villas are a desirable vacation option, giving travelers an over-the-top luxury experience that is often far removed from our daily lives. Stay in a castle, a beachfront mansion, or a ski chalet in the Alps - there are many options for luxury villa holidays.